Attractive rustic bedding comes with many different themes and interesting outdoor scenes. The tricky part will be deciding which theme you like best. Wildlife décor is perfect for almost any log or timber home—whether in the woods, by the lake or river or sitting on top of a mountain in Tennessee! 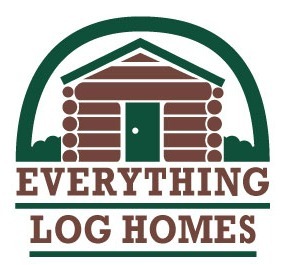 And you have many choices for your log cabin decorating! You can use pine cones and trees, with wild animals like bears, wolves, fox, deer and even smaller animals like raccoons. Southwest bedding gives your rustic log cabin or timber frame home the feeling of being in a lodge or ranch, and this selection of southwest has some of my very favorites. Colors in southwest bedding are often rich and bold, and you’ll find reds, oranges, browns, rusts, and turquoise in comforters and accessories. Typically, southwest bedding has geometric patterns like those used by the Indians in the area. You’ll see motifs of teepees and feathers and very organized patterns. Fabrics in southwest bedding include warm fleeces, cottons and faux leathers. When you use southwest bedding in your rustic lodge bedroom, you will achieve a casual understated and sophisticated elegance. Have you ever looked around, in a group of outdoorsmen? Camo is definitely in! And, while camo is intended to camouflage something, it comes in many different patterns. You can find a camo comforter set that has autumn leaf coloring, a camo comforter set that looks like the desert, or even a pink camo comforter set. And camo is no longer limited to branches and trees. You’ll even find patterns with corn stalks, sunflowers and antlers. Your choices are limited only by your imagination and the effect that you want to create. Cabin bear bedding can be dramatic or subdued, fun and frivolous or serious. And black bears are always a favorite for rustic log or timber frame home decors. With black bears, you can have whimsical bears that are fun—or you can have realistic bears that are natural. 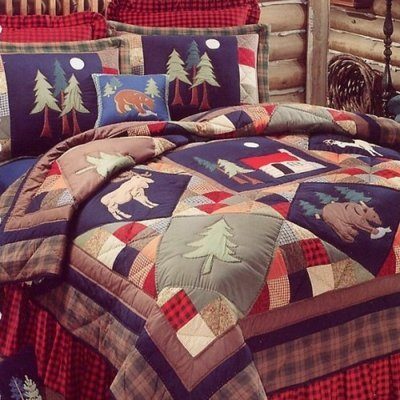 With so many cute cabin bear bedding sets on the market, choosing the best one for your rustic décor, may be the most difficult things that you do. Use your cabin bear bedding to pull your wildlife theme together, and make sure you coordinate your cabin rugs, your window treatments and rustic cabin wall décor, to bring the theme together for your log home. Bears and rustic cabin décor go together like a horse and carriage. Black bears make country bedding fun, and you just can’t go wrong with using bears with your other wildlife motifs—deer, moose or wolves. If you have a rustic home, don’t overlook the possibility of using bears in your décor, in at least one of your rooms. Of course the bedroom is an easy one to start with, and bears just naturally go well in that room. 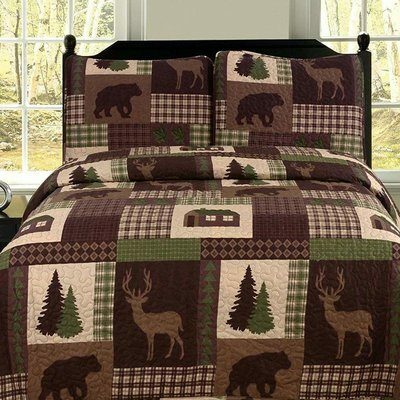 Your cabin bear comforter will be center stage in your bedroom, and it could be the most important piece in the room. Bear bedding comforter sets work well in many different rustic decors. Use a bear comforter in a log cabin, a rustic lodge, a timber frame fishing lodge or a lake cabin. Use a cabin bear bedding set or quilt that you like, and build your bedroom around it. Use sheets that complement your theme and accent pieces that will reflect your bedding theme. Choose your bedding carefully, and you’ll end up with a fun and interesting bedroom with a rustic bear décor! Bears, whether black bears, grizzly bears, polar bears, brown bears, Kodiak bears or teddy bears—all have a way of winning our hearts. 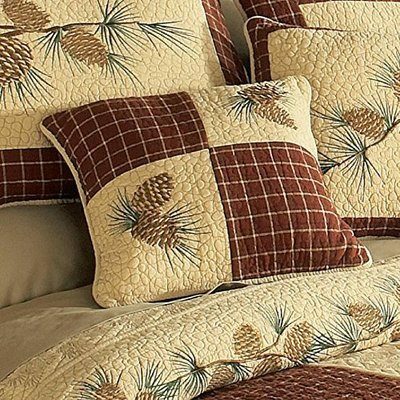 Western bedding sets can put the finishing touches in your rustic bedroom decor, whether you live on a ranch in Montana or you have a timber frame home in the mountains. Whether you choose to go with native American motifs and designs, horses, ranches, wolves or cacti, there is a designer cabin comforter that will work in your Western décor. Western theme bedding will complete the Western décor in your bedroom. You will see your designer comforter the first thing in the morning—and the last thing at night. 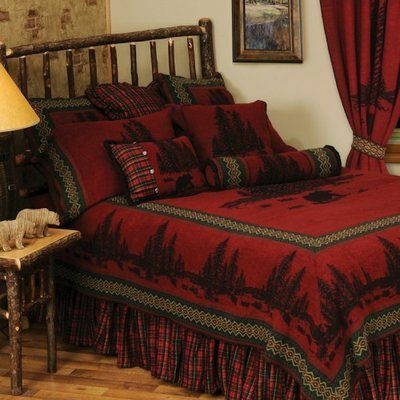 Your log cabin or timber lodge will be enhanced by the rustic appeal of western bedding. And the cowboys in your home will go to sleep—tired but happy, under their cowboy comforters. Wolf bedding, although sometimes hard to find, can add pizazz to your western, wildlife or nature décor. Wolf comforters and throws go well with other nature or wildlife theme items. And wolves are such interesting creatures that you can also use wolves as the main theme for your home décor. Pictures of wolf packs and wolf pups can make your comforter or bedding very interesting. And wolves bring to mind northern lodges and hunting camps. Wolves travel in packs and they mate for life. They care for their young together, and, as such wolves have a community. We could learn a lot from wolves! When you use wolves in your bedroom décor, you add rustic appeal and interest to your room. And there are so many fascinating pictures of wolves on cabin bedding. You can choose a ferocious wolf baring his teeth, or a gentle wolf caring for her pups. Or even a whole pack of wolves, howling at the moon together, on your designer wolf bedding! Keep in mind that your choice of fabrics can also influence the look that you achieve. If you choose soft, shiny fabrics, your bedroom décor will be less rustic than if you choose fleece, hand woven linens or heavier fabrics. And colors will also influence the look of your rustic décor. Choose colors that reflect nature, as opposed to bright colors that you don’t see in natural settings. Create a seaside retreat in your coastal timber frame or log cabin using nautical comforters in your bedroom. In fact, you don’t have to live on the water to have fun with a “nautical” decorating theme. Your comforter is the theme setter in the bedroom. The comforter is front and center in the bedroom, and it is the largest eye catcher in most bedrooms. Choose a color scheme that is pleasing to the eye and that reflects your love of boats, fish or the sea. And make sure that you carry your theme throughout the room, with your choice of decorative pillows, curtains, and wall décor. Whether you choose a rustic dockside theme, or a whimsical tropical fish theme, you can easily get the atmosphere that you want—and you’ll enjoy it for years! Christmas bedding and comforters can make your Christmas traditions special and your log home, picture perfect! Consider novel Christmas bedding to spruce up your bedroom for the winter months. There are so many cute and beautiful country comforters that are perfect for the Christmas season. Have you even been in a log cabin or lodge at Christmas that wasn’t decorated? If you have, it was a highly unusual experience! Log cabins and timber lodges are just synonymous with Christmas décor. In fact, Christmas holidays in your lodge or cabin will be the most memorable time of the year—every year! So don’t neglect the bedroom. Fill your private space with color and beauty, and make sure you have a special Christmas comforter or quilt to celebrate the season! Most people have fun decorating the common areas of their home, but the sometimes forgotten bedroom area is the perfect place for private and special Christmas holiday décor. Beach scene bedding works well whether you are decorating a beach house or vacation home, or you are simply bringing some seaside fun to your log or timber home. No matter what it is that you love about the beach, you are sure to find beach bedding that will remind you of fun vacations. Beach scene bedding is uplifting and fun! It brings back memories of building castles in the sand, lazy days reading on the beach, riding the waves, the sound of waves lapping on the shore, seagulls sounding off in the distance, and watching the full moon over the ocean after dark. trees or bright tropical colors and whimsical scenes, you will love being in your beach décor bedroom! Keep your theme simple, and choose colors that are complementary. Don’t forget to use beach scene bedding when you outfit your beach cabin or cottage. A bright beach quilt or comforter will set a festive tone for your bedroom. In fact, if you do it right, you can almost hear the sound of the steel drum bands of the Caribbean when you walk into the room! Smell the sea air and feel the ocean breezes as you enjoy your tropical paradise, regardless of where your home is actually located. And don’t forget to keep things casual. This is not meant to be a formal setting. Decorating your beach house, coastal cabin or seaside post and beam home with beach decor is fun! A fish comforter is the perfect bedding for your rustic fishing lodge. If you are decorating a waterside cabin, you will need to choose the right fish bedding for your lake house décor. If you choose a country quilt or comforter with fish on it, that will enhance your fish theme. When you visit a fishing lodge, you just expect everything to reflect fishing. That includes decorating the bedrooms with a fishing theme comforter. But don’t limit your lake house décor to just fish. You can also use home accessories that include fishing rods, fishing reels, old fashioned wicker fishing creels, fishing vests and fishing lures. Photos of boats and lakes or rivers will also go well with your bedroom fishing décor. Just remember that you need to start by choosing the largest piece in the room—your rustic fishing comforter! 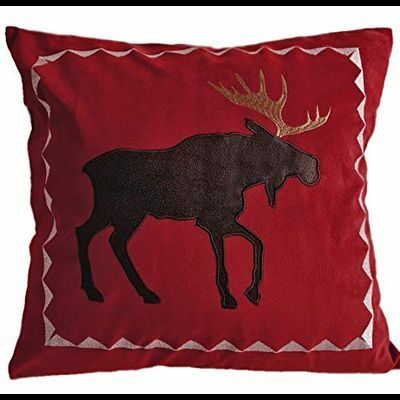 A Moose comforter is a fun addition to a wildlife or country décor. If you have ever seen a moose in the wild, I can say with assurance that you are hooked! Moose are one of the most magnificent creatures that you can observe outdoors. And if you don’t know where to look, they can be difficult to find. Using a moose comforter in your bedroom décor can add rustic interest. And moose comforters can give your bedroom rustic charm, whether your theme is Northwoods, moose or wildlife decor. Moose are part of the romance of being outdoors. And using moose in your decorating scheme, brings the great outdoors into your home. These magnificent creatures bring to mind quiet nights around the campfire while camping, hiking in the wild, and gentle mornings near the lake, where a glimpse of a moose is captured. Let’s face it. When you think of Maine, New Hampshire, Vermont, or any of the Canadian provinces, you also think of moose. If you’ve ever seen a moose up close, they are BIG! And they are curious creatures who will stand watching you for a while—even if you get pretty close to them! Often moose comforters have a whimsical look and they add lightness and fun to your bedroom. Even though we don’t see them very often, when you do see one, it’s an event! It’s really exciting, and an experience that you will be talking about—for years to come! 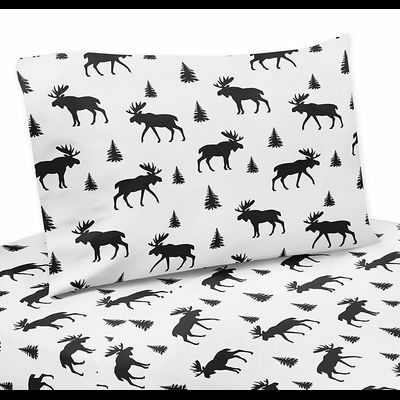 Of course you don’t have to use moose exclusively in your bedroom theme. You might try moose and bear bedding or a moose and deer comforter set.